So, I've never made a bunting before, heck, I didn't even know what that was up until a few weeks ago! None the less, I think they're pretty cute for parties, weddings, photography, or holidays! I decided to give it a go and make one for our mantle for Fall! 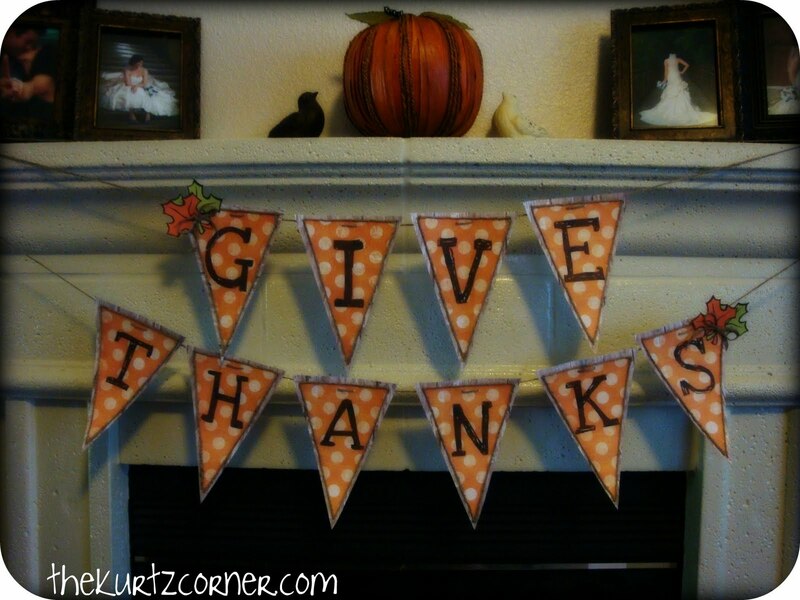 For this type of bunting you will need scrap book paper, which you can get from Hobby Lobby for 59 cents each, or cheaper if you catch them on sale! 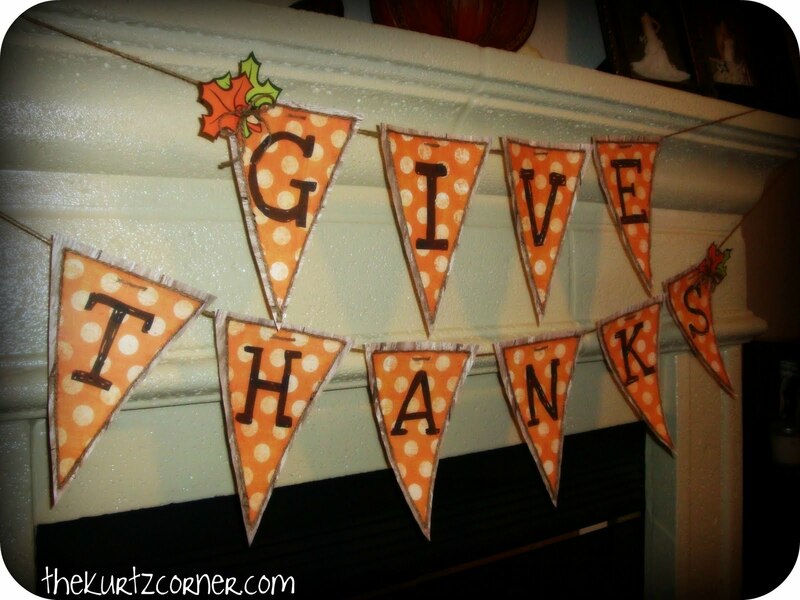 You will also need, a glue stick, twine, scissors, and Mod Podge. I started by cutting my primary paper (the orange polka dot one) in to sheets of 8 x 10 so I could feed them through the printer. Next, create a template triangle out of something sturdy like cardboard. Print out your letters onto you scrap book paper and use your template to trace your shape. A helpful hint, you can hold your printed paper up to a window while holding your template behind it so that it creates a shadowbox effect so you know exactly where to trace your template. Cut out your triangles and glue them onto larger triangles. You don't have to do this step, but I like having a secondary color. Next, I created an outline between my two triangles by gluing twine on the border with my Mod Podge. Last, create small holes in your triangles and weave your twine through to make your hanging strands. Next on the agenda, a "Just Married" bunting for my Sisters wedding next month!! Ahhh! This is really sweet! I love the whole look of it! I hope you'll share this at Show & Share this week! I love this idea! Great job on your first bunting. I’d love for you to link your adorable project to Things I’ve Made Thursdays. I’m trying something new this week- We have two sections to the party- one for kids’ things and one for “Anything”!! I think this post would be an awesome addition to the “Anything Goes” party! This is adorable! 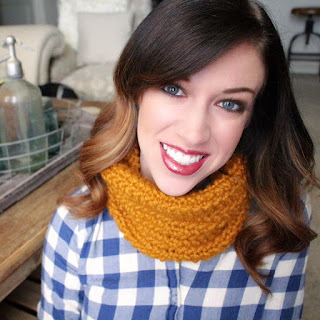 I love buntings : ) Thanks for sharing at Craft and Tell! Very cute! I just finished up a Board and Batten project and could definitely see something like this hung from the ledge. Thanks for the idea! I'll use it this fall! Look awesome especially being your first bunting! ADORABLE!! I love the polka dots! Thanks so much for linking up to Sassy Sites for our FFA party! Have a FABulous Friday!! LOVE this, AUdra!!! I can't to make it myself! Thanks for the awesome tutorial! :) Have a great weekend! *p.s.- I linked up to your linky party today. :) Sorry I am a little late! Yay! I am so happy to see this cute little bunting in my link party. You are one creative gal. I'm really loving your blog, by the way! Looks very cute. And great tutorial. Thanks for sharing and from a girl that had to leave Texas- I miss the great state you live in. So Cute!!! I shared this on the Glitter FB page! I love the polka dots! From the pictures, it looks like a fabric bunting. Great job! Came over from Running with Glitter. This is such a beautiful and fun banner! Please feel free to link up your Give Thanks banner to my Make Yourself Monday Blog Hop! #2..You are most clicked on "Flexible Posts" @ Anti-Procrastination Tuesday and are featured this week. Thanks for linking up at New Nostalgia! wow! This banner is so cute! I love it! Hi! I could have sworn I’ve been to this weblog ahead of but right after searching by means of many of the publish I recognized it is new to me. Anyways, I’m undoubtedly delighted I discovered it and I’ll be book-marking and checking back again often! I saw your link on "A Glimpse Inside" and thought I would check it out and I was surprised when I saw what you blog was called:)...my last name is Kurtz too and you don't hear that last name very often. I really like your banner. Really like your blog and I'll be stopping by again! Thanks!